Here’s my short answer: Sure! A friend of mine convinced me to go the first time, so if you want to come with me next time, I’m your gal. Now, here’s my long-winded answer. While BlogHer can be wonderful and wild and incredible, it is at first invigorating and then exhausting. I attend to see hundreds of friends I normally only get to hang out with on the Internet, to meet writers I admire and to connect with more women who do what I do. I am also there to learn from leaders in social media and maybe even garner a professional opportunity or two. 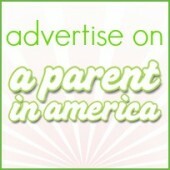 I believe BlogHer is worth the time and monetary investment. I do not believe that every female blogger needs to attend BlogHer in order to find success online, but I do firmly believe that if you go, go with the intention to learn and connect with others. Don’t go to party (oh, how I despise the use of “party” as a verb) or grab for free stuff. The parties are fabulous, sure, but they are foremost a unique and fun forum for meeting more great people. Do go to bond with women in your pajamas over wine or fancy flavored Pellegrino in hotel bathroom glasses and croon the intro to DeGrassi Junior High with people who make your heart sing. Do go to see your sisters, grow your business and hone your writing craft. I also attend conferences, and occasionally speak at them, to spread the word about blogs which aim to strengthen and inform communities, the goal of my very first blog for DC-area families, A Parent in Silver Spring. 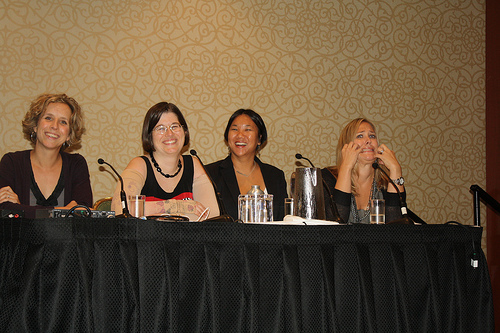 In 2010 I was a Room of Your Own panel moderator on Resource Blogging, and my co-panelists were three of the women I love most in this world…and the next: Leticia Barr, Amy Mascott and the late, oh so beloved, Susan Niebur. The process of planning our presentation and the challenge of providing to attendees tangible help for improving or beginning their own resource blogs brought us closer together. (We also worked with the beautiful Jean Winegardner, but she was already booked to speak in an autism session panel and BlogHer didn’t let her double dip.) Hopefully, we assisted other resource bloggers in their journeys. It was really, really, really hard to attend this year’s BlogHer conference without Susan. In 2008 she urged me to go, gently but persistently. We were new friends, I was a new blogger, and she promised that it would be a wonderful time. She roomed with Stimey, I bunked with Tech Savvy Mama, and the four of us had a stupendous time. In 2010, the four of us again attended together, requesting rooms side-by-side. We presented our ROYO together. And many of us DC Moms who consider Susan our sister sat in the front table to cheer her on as she was honored for her writing and selected as one of the Voices of the Year. (Please read her honored essay, In the name of awareness, if you have not already.) It was a moment of triumph for Susan, and all of us who love her wept with love and pride. She was tired, so tired on that evening, after pulling a long BlogHer day in the midst of treatment, but she rallied and made it and she was magnificent. She also looked radiant. The week before BlogHer 2010 Susan and I were on the phone talking packing and dresses, and when she expressed worry over what to wear I filled my minivan with dresses that I thought would look pretty on her punk rock, post-op, brave figure and drove over. When she put on the royal blue silk trapeze-style 3.1 Phillip Lim dress, we knew it was the one. That dress again hangs in my closet. Her husband Curt and her mother Pat gave it back to me after she died. 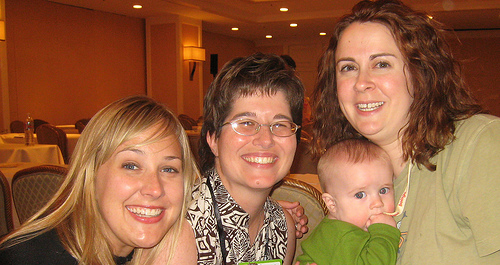 I didn’t attend BlogHer 2011 because Alice was too little and Susan was too sick to go. Last summer I couldn’t imagine attending BlogHer without Susan and instead of flying to San Diego we spent a ton of time together during the summer months. Kristen also sat out BlogHer in sisterhood and solidarity. 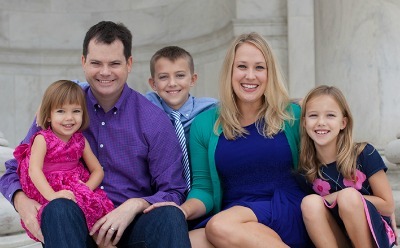 We talked about things big and small, gave our kids water pistols, ate bacon and watermelon, cooed over baby Alice, and tried to strengthen our faith in God, even as we knew Susan’s days were winding down. This spring Susan’s best friend Marty asked if I was thinking of going. Marty had submitted another beautiful post that Susan wrote at the end of her life, “It’s Not Fair!”, and it was chosen as a Voices of the Year honoree. Leticia and Amy and Jean and Kristen asked if I was going. Again, I said that I couldn’t do it without Susan. How could I go without her when she was the one who always urged me to go? But then Susan’s husband Curt (WhyDaddy, although Susan often referred to him as WonderDaddy) called. He had two tickets that he and Susan had bought back in 2011 for this year’s BlogHer…did I want one? And so I went. Because another Niebur gave me the nudge. The first day of BlogHer I was honored to receive an invitation (along with Marty and other blogger friends of Susan) to an event hosted by the American Cancer Society and their Blogger Advisory Council, of which Susan was a member, along with Leticia and Elena. We met at Hope Lodge, a warm home away from home for cancer patients receiving treatment when in New York. 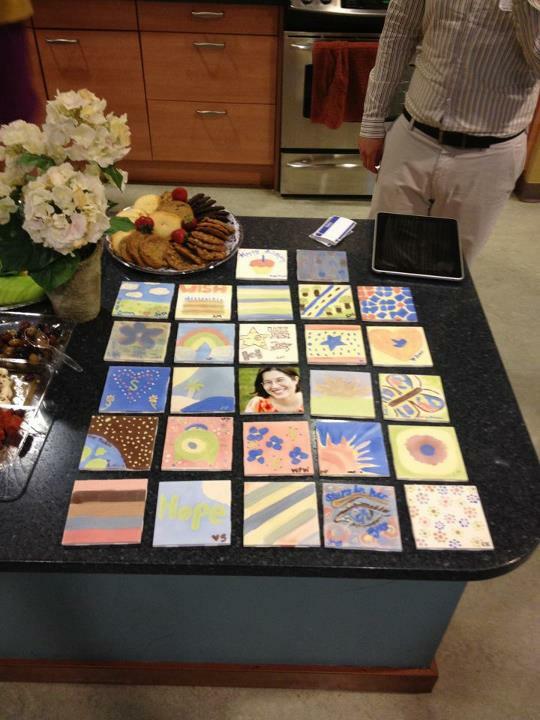 There, led by survivor and artist Darryle Pollack, we painted individual tiles which Darryle will assemble afterwards in a piece in Susan’s memory. The completed mosaic of love will decorate either Hope Lodge in NYC or the ACS headquarters in Atlanta. Later that evening I volunteered in the Serenity Suite at BlogHer, a place where Susan was able to catch some important rest and quiet in 2010. I was so grateful to meet my co-volunteer Annette and the Serenity Suite rock stars Maggie, Heather and Ellie. Those women are angels (and crazy-smart devils) for creating a haven of peace and sanity, in addition to serenity, within the hectic BlogHer bubble. The next day I thought I would skip the Voices of the Year community keynote. It was being held in the exact same room where Susan gave her own community keynote. Although I felt better after the ACS and Serenity Suite experiences, I was still missing Susan so much. I tramped through the streets of New York, filled with anger that she was no longer there with us. But then I received texts from Marty and Jean and Amy and Stacey and Sandie and Sue and J.J. that they had the table, they were saving a seat for me. Where was I? Again, those loving nudges reminded me so much of our friend. Those other women loved her just as much as me, and they were bravely sitting there in the front, right where Susan would be sitting (or more likely, looking down at us from the stage) if she were here. So I came in late, crouching down M*A*S*H helicopter style to get that seat with our DC Moms crew, Susan’s girls, right in front. They had hugs and cupcakes and tears in their own eyes. And we listed to this year’s Voices of the Year. We clapped and cheered and laughed and bawled our eyes out. Susan’s spirit was with us after all. I’m so glad you went and had that time to remember such good times while you made some new ones. She elevated everything she touched, and your mutual ministry is one of the loveliest things I’ll always carry from my time knowing Susan and you, together and separately. Thanks for continuing to share it here. In the end all we have is love and each other. @Laurie, Thank you Laurie, and thank you for letting me know about the Serenity Suite’s dedication to Susan. You have me in tears. What a beautiful memory. I didn’t know Susan. But I know you because of Blogher. And I have her to thank for it, it seems. Thank you for sharing this. @Andrea (Lil-Kid-Things), Meeting you was one of the very best parts of BlogHer 2010, and seeing you again there this year was one of the reasons I ultimately went. Love you girl. This post is the power of blogging … the last photo – the heart. Susan touched so many lives, and her words blessed us all. But for you, her closest friends … you will truly be soul sisters forever. @By Word of Mouth Musings, Meeting you this year at TypeA was so great – new friends are the BEST part of blogging conferences! Thank you for your words. Im sorry I missed VOTY. I wish I knew we were all together again. I missed her so much this year, thinking of last year and the year before. I had fun with you in NYC. And Im glad you were able to enjoy the time you had. @Jodifur, I loved hanging with you and I am one luckyducky that I can do it frequently back here at home!! Oh Jess! How I treasure all of the memories of Susan that you shared! They are so wonderful and precious! BlogHer will never ever ever be the same and as hard as this year was for both of us to go without Susan being there as our roommate and co-panelist, I have to think she was looking down on us above, so proud of us for connecting with members of our community, learning, and sharing. @Leticia- Tech Savvy Mama, Thanks girl, my bloggy BFF. Susan always did BlogHer right. Thank you for including me in the ACS event — being at Hope Lodge and talking about issues that Susan fought and worked for was very important to me. Beautiful post, beautiful memories Jess. Great job. @Patti L, Thank you Patti!! That was absolutely beautiful, Jessica. What a stunning way to honor Susan’s memory. You were, and always will be a wonderful friend to her. How luck you were to have had that time together. Oh, what a roller coaster you have been on…and BlogHer for you will always have these deep meanings and connections. I didn’t know Susan, but through stories I feel that she was quite a person to have in your life…and she was lucky to have you. @Sherri, Nope, I was lucky to have her. Thank you Sherri! Lovely. Next time BlogHer rolls around, I want to go with you, to honor Susan. Thank you for writing this. Not a day goes by without my thinking of her in some way. Just lovely. @Colleen Z, yes, you have to come to BlogHer or another blogging conference. You will love it! Love you and I hope your own healing is doing OK. Thank you so much for being a fierce friend to her and playing a big role in her faith journey. @frelle, every woman blogger Susan met was immediately a treasured friend, and I am so blessed to get to be your friend too. Love you girl, hugs right back. A beautiful tribute to your friend. I wish I could have met her. What a legacy of friendship she left behind. that was beautiful, Jess. Absolutely. you are SO lucky, so very fortunate, to have a friend like Susan by your side, always. Hugs. @Julie, well, I am so fortunate to have met and now love YOU. Thank YOU. Jess, I’ve never met Susan, I have heard of her through mutual friends, but your heartfelt story made me feel as if I did get to meet her, which is lovely, really. Carry on, mama. As your friend, I can tell you how special this type of sharing is because no matter what, your friend Susan is living on and being honored. @rajean, becoming friends with you this year, connecting at TypeA, have been so great this year. Muwah! Beautiful. So beautiful. Thank you for sharing your love for Susan. I so admire your friendship. Thank you for such a heartfelt and beautiful tribute. Sometimes you need that kind of inspiration to get up in the morning. I’m new to the blogging world and was too scared to go to BlogHer this year (especially alone). After reading so many post-conference stories, I have been considering attending BlogHer next year. You have just given me the nudge I need. I thank you and Susan. @Nicole, Yes, you have to come next year to BlogHer or another conference! I didn’t know Susan well, but I came to adore her in the couple of things we did together. The few moments I had at Hope Lodge with you all painting my little tile were among the most serene and gently inspiring moment of this entire BlogHer. Thank you for keeping her vibrant and very much present for all of us. @Chrysula, those were the most serene moments of BlogHer for me too. Thank you for your loving words and for When You Wake Up a Mother! @Jeannine, Thank you Jeannine. The first night I met you was at the MNAC party in Petroville, when we were all united against breast cancer and Susan was feeling good and having fun. I adore you right back. Oh honey. What a lovely post. Susan’s energy has reached out and touched me a couple times since she died, and I am always so comforted. I love how her husband called to offer the ticket. I hope it was a small comfort to you, her friend. @Thrift Store Mama, I am so happy that you have felt her spirit this year. And yes, Curt is incredible. It was a sincere pleasure meeting you in the Serenity Suite – you are a bright light in this world, and it was terrific to spend a little time getting to know you. One of my favorite parts of BlogHer this year was the amount of time Susan’s friends met in the Serenity Suite, swapped stories, shed a few tears and some wrote on the notecards in her memory. It seemed like such a SMALL gesture for such a HUGE spirit. But her spirit was everywhere there. I just know it. @Ellie, meeting you the first night was a treasure, especially after your extremely tough year. Thank you for going straight for the connection, even though we just met. And thank you for the cards for Susan in the Serenity Suite. That was my best interactive expo station at BlogHer, for sure. What a beautiful post. I never met Susan but I feel know her in a internet-sort of way through posts and her loving tributes. Beautiful post and beautifully written. @Corey Feldman, than you, so much. I’m so glad to read this. I was worried (selfishly) that you wouldn’t come and then when I knew you were I was worried how it would hit you. I remember seeing you guys soon after VOTY and wanting to hang out but you were headed back to the room with Susan because she was tired. It was then I realized what an incredible friend you were to her and then that I figured out how much this would hurt. I thought about you the whole conference-how every room was the same and her memory must be everywhere. I worried for you and so wanted to do the right thing when I saw you. I’m glad to read that indeed her memory was there but it was lighting the way instead of returning the dark. I should have known-everything she did was full of light. Of course, that’s what she has left behind for us-her light. I”m glad you enjoyed the weekend. I’m thrilled I got to spend a bit of it with you. How lucky we all are to have you to light our lives like Susan did for you. Love you Jess. I’m not really sure what to say other than your post touched me. I remember hearing of Susan’s passing on Twitter- but she was new to me. I found out about her story only after she passed away but I have been touched by it nonetheless. I’m so glad you went to Blogher this year….I bet she was nudging you along the entire time. What beautiful memories you have and what a lovely friendship you had because of blogging. I wish I had known Susan. I came to the BlogHer community too late. As a newbie, Voices of the Year was the best part. Great post on recommending that we view it as a time to hone our craft. And nothing wrong with a little fun. I am returning in 2013 in Chicago. This is such a beautiful reflection of your friendship and your love for Susan. My heart aches that she is no longer here and for the many people she reached. I wish I had gotten the chance to meet her, but I have read her words and shared some moments with her online and I know why she is so deeply loved. What a wonderful, unexpected, deeply moving, up-lifting and powerful blessing it is to belong to a community of gifted women who write, inspire and raise each other up. I will always count myself as beyond lucky to have known Susan, to even briefly sand in her light. LOVE YA MOMMA! I have only gone to the two NYC BlogHers, and in 2010, in all the sea of people, I ran into Susan everywhere. She was like an anchor in a crazy storm. It was so hard this time being in the same hotel and the same ballroom and knowing I would not run into her. My MIL is staying at the Hope Lodge in Nashville starting tonight for the next two weeks for a clinical trial and I am so grateful for Susan’s (and other’s) work with the American Cancer Society for paving the way for all the cancer patients who follow them.